Air filters are designed to filter the air – that is, keep the equipment protected from dirt and debris, and keep your indoor air protected from allergens and other contaminants. Air filters capture lint, dust, smoke, mold, pollen, pet dander, bacteria, and other things, allowing for a healthier indoor environment. 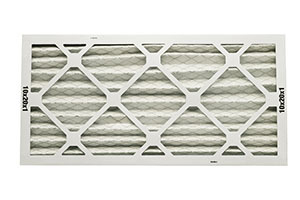 Clean filters keep the air you breathe cleaner. When the air filters become clogged and dirty, they begin to allow dust and debris through the ventilation system into your home. It creates more dust, leaving a film on all surfaces, then re-circulating that same dust and grime through the system over and over again. Dirty air filters are clogged air filters. When airflow becomes obstructed, it makes it more difficult for your HVAC system to do its job properly. It has to work harder to produce the same (or poorer) results. That also means it’s consuming more energy – and more of your money. Eventually, insufficient airflow can cause a variety of problems for your heating and cooling system, including areas of uneven heating and cooling which cause reduced comfort. Your system may start having extremely short on/off cycles or start running continually which puts stress and strain on the equipment. At some point, dirt buildup can cause a motor to overheat and break down – or cause condenser coils to ice and freeze up the air conditioning unit. These are big, expensive problems that might be avoided by simply keeping a clean filter. Your HVAC system represents some of your home’s most important investments. The best thing you can do for its health and maintenance is change the air filters regularly. It will save you money in the long run in energy costs and equipment repairs. You can do it yourself, or have it done as part of a regular maintenance contract with a local HVAC company.